Which animals make war, other than humans? Earlier this week, the New York Times covered a study that proved chimps make war on each other, slaughtering enemies and eating their children. But does that really count as "war"? Monday's report in the NY Times on chimpanzee "warfare" isn't quite accurate in the use of the word "war," as my investigations of ants confirm. As in most human hunter-gatherer groups of similarly small size, chimpanzees target single individuals in a stealthy raid, rather than carry out the full-bore mass attacks developed over the past two millennia by the human societies populated with hundreds of thousands or millions. In my book Adventures Among Ants, I found the same strategic shift occurs across ants as the size of their societies similarly increases from dozens into the millions. Indeed, among animals only ants and humans have societies at the upper end of this size continuum, and only ants and humans turn out to have true warfare. Of course chimpanzees are close relatives of humans. But the behavior of ants suggests the size of social groups can explain strategies for fighting, even across unrelated species. What do you think? 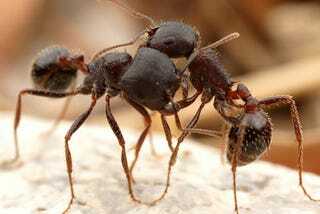 Are ants warlike while chimps are just skirmishing? Are only humans capable of war?